Today (queens day) was a beautiful sunny day. It seemed a good idea, for the first time this season, to be active from the field. 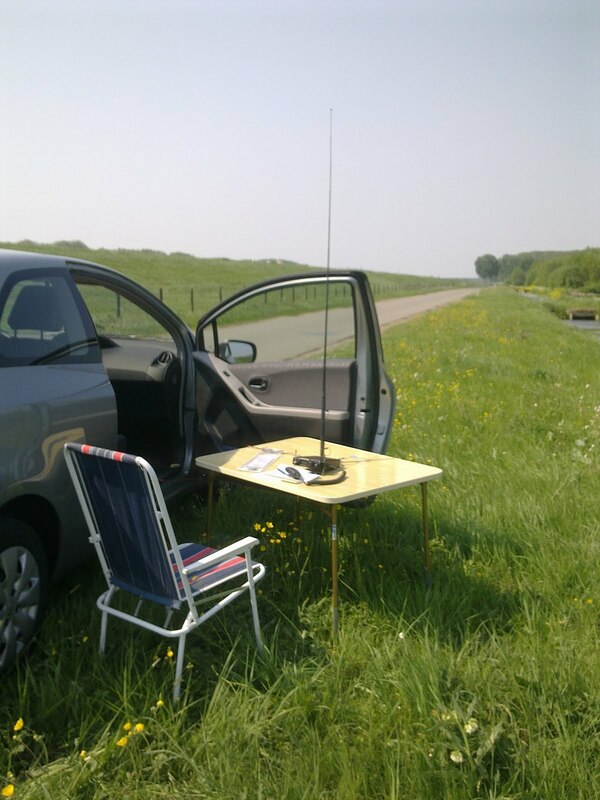 I put the suitcase with the FT817nd and ATX-1080 antenna in the car. A folding table + chair was already packed. I unpacked everything in the field near Maurik. On 20M was not to much activity and the strength of the signals was also disappointing. I made ​​1 (ssb) qso with E75MC. This operator was amazed about the strength of my signal. I worked with 5 watts. I took this photo with my mobile phone. Last year it strucks me that I couldn't make 5 watts from the car battery, the voltage was too low. This time I had the engine running and the voltage from the cigarette lighter point was enough to made 5 watts output with the FT817nd. Despite the sun, I did not stay long, it was very windy. Q5 in a peppermint can. In my previous post I forgot to publish a picture of the Q5 30M transmitter. Built into a peppermint can, including the filter. During Easter I visited my mother in the northern part of the Netherlands. In her house is a ZEPP for 30M hanging, on the topfloor. Normally I span the last few meters via the window to the end of the garden. This time I put the last few meters to the floor in the attic. I brought my Q5 30M transmitter and wanted to see whether the signal would be heard by someone. The next project is a switchbox to connect a seperate tx and rx to an antenna. I gave a CQ several times on 10.116 MHz and saw that my signal was heard in Slovenia. A distance of almost 1000 km with about 250mW output. This experiment was successful. Then I wanted to try my Rockmite 40M transceiver. On Easter Sunday there was a contest in HB9 and impossible for me to make a qso. After the contest, I made ​​a new attempt, without success. Always difficult with a crystal that you can not move. I had a few successful qso's with this trx made​​ in the past.